I've recounted my former distaste of spaghetti squash before and how all that changed once I started eating it like this and this. Well, this pepperoni pizza-stuffed version is another recipe that makes me love spaghetti squash and even look forward to when it is in season. I guess the secret of my love of this squash has been cheese, but hey, that's alright I suppose. This recipe takes all the flavors of a pepperoni pizza and mixes them into a spaghetti squash that is baked again with mozzarella cheese on top. A low-carb pizza casserole if you will. We both enjoyed this dish a lot. It was hot, bubbly, cheesy, comforting, and just really good. This recipe will serve two people. You'll want a half of a spaghetti squash per person. I served these with a salad for a complete meal. This recipe is being submitted to the 12 Weeks of Winter Squash event. Check out all the other winter squash recipes at bottom of this post and feel free to link up yours! Preheat the oven to 400 degrees. Place the spaghetti squash in a baking dish, cut-side up. Bake until fork tender, about 35-40 minutes. Remove from the oven and let cool until you can handle them. Carefully scrape out the spaghetti squash strands into a large bowl, taking care to not break the skin. Put the squash skins back into the baking dish. Add the remaining ingredients, except the mozzarella to the bowl and stir until well-combined. Add more sauce, if desired. Divide the mixture equally into the spaghetti squash skins. Top each with half of the mozzarella, a bit more Parmesan, and a sprinkle of Italian seasoning. Return to the oven and bake until the cheese is melted and golden, about 25 minutes. You can pop them under the broiler for a couple of minutes to get the cheese extra browned. Serve hot topped with an extra sprinkle of parsley. Okay, this is TOTALLY happening in my kitchen. Spaghetti squash may be my favorite winter squash - and I can almost taste this deliciousness! What a fun idea! I'm planning to make a lasagna stuffed one next weekend, but this one looks awesome, too! what a great way to eat spaghetti squash! 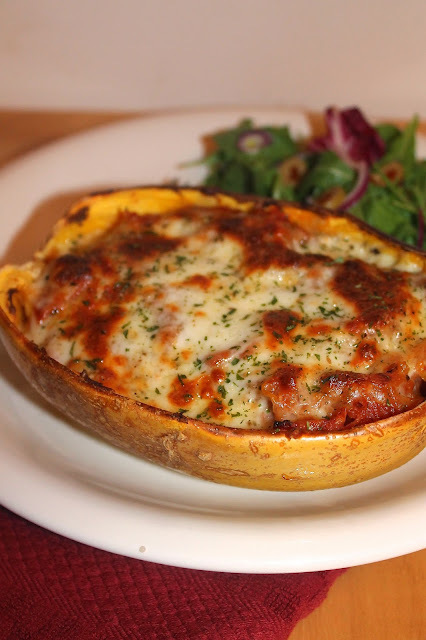 What a great idea to make spaghetti squash into comfort food! Yes, please! This sounds awesome! This seriously looks like the best way imaginable to eat spaghetti squash! Can't wait to try it! What a delicious way to serve spaghetti squash...I love this idea....so creative Amy! i am very intrigued by this! i've been trying to trick my kid into eating more vegetables. why didn't i think about filling them with pizza??? Amy: What a creative dish -- without the heaviness of the pizza dough. It also looks quite yummy! Ooh, this version of spaghetti squash looks so so SO good. I am definitely going to be trying this! I've never had spaghetti squash before but now I seriously want to! This looks so good! This looks amazing! I should be making more squash recipes! 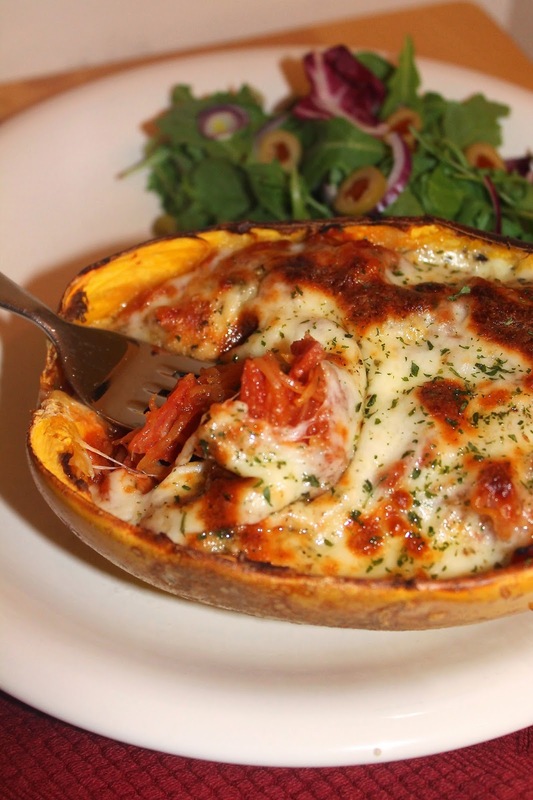 Wow, pizza stuffed spaghetti squash.. it doesn't get better than that. I love the idea of adding pepperoni! This is definitely a unique recipe, but it sounds tasty. I love the link up idea. Now I have squash recipes to try for the Fall season. What an incredible way to enjoy spaghetti squash--yum!! I love this, never would have thought to use this squash as a pizza, a must try. Wow, what a terrific dish! All the flavors I love in pizza, but something that's relatively healthy. Good job! And thanks. I bet this is delicious, love that you can enjoy pizza without the crust. I'm drooling over here Amy! This is definitely one of the best ways to eat spaghetti squash! I love this idea! I am totally making this! I love this idea- so easy and so satisfying without totally de-railing to the carbs! OMGOSH this is the perfect keto or low carb dinner! Pinned it--thanks for linking up!